Re: Hamster bleeding from nose. If Sassy has been bar chewing constantly for some time, it will probably be a habit now, so as the others say moving her to a tank style cage is probably best. Although you could try something in her current cage first and see if it makes a difference. Is it the hamster heaven you have? It sounded like it by the dimensions. Sometimes that cage is better with the tubes and penthouse removed and the tube holes blocked off. Of the two plastic shelves it comes with, you could remove one and put a good sized nesting box house in there. I don't know what your set up is, but if something isn't right in the cage for them they can get stressed and want to chew out. It could be an issue with a wheel, or something else not right. If her wheel isn't big enough and causing discomfort, she will be wanting to let you know. As RH says, a lot of cage cleaning can cause stress and make them want to escape too as nothing will smell familiar. Sometimes if the wheel isn't working properly as well they try and let you know. Hamsters tend not to like changes as well - but sometimes a change that improves things they are ok with, and added things they like can be good. Ours accepts changes as long as he approves of them! And it can distract them from bad habits as well. So if she has a big enough wheel, plenty of substrate (minimum 3 to 4 inches but as much as you can fit in ideally) and has somewhere to build a nice big nest in these cold months, then her environment is good and it shouldn't be anything like that causing her stress. Cage cleaning could be the other thing - if you do a big clean once a week, (sometimes people think this is the right thing to do or have been advised to) then that will be causing stress. As RH says it is better to spot clean and then only do a partial clean each time. So for example, only remove the top half of the substrate and mix the bottom half in with the new added substrate so it still smells familiar. And clean the toys a different week from the substrate. The wheel you can wipe out as and when, but best to mostly wipe out in the cage and only take it out to fully wash it if it really is bad. (Our hamster would get extremely stressed by any cage cleaning and I do this partial method now, which he accepts). Even then I only do a substrate clean every few months, because if they use a potty and you spot clean it stays pretty clean and dry. 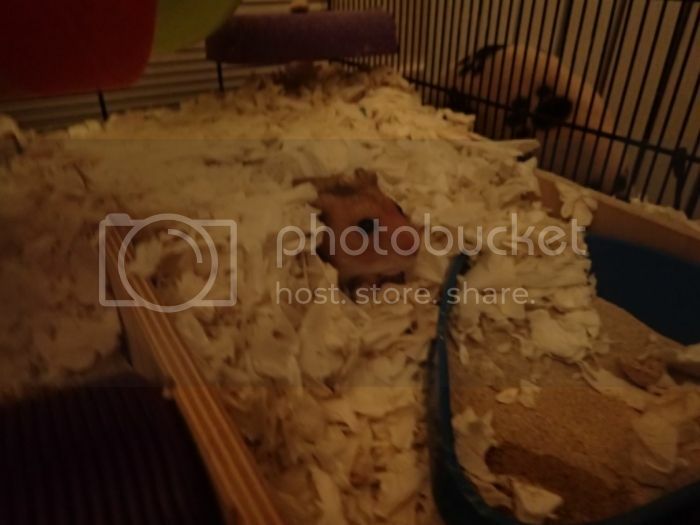 I got a lot of tips on here about cage cleaning, but also from Erin's Hamsters video which explains it really well and the method she suggests is easy to follow and makes sense. Apologies if you know any of this already I'm just mentally ticking off an environment possible causes. 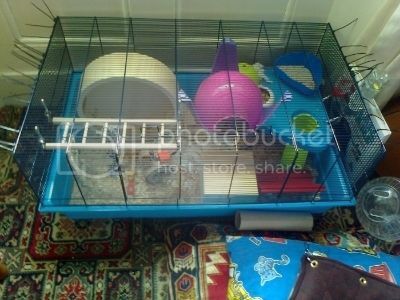 The same could apply with Munchkin, your dwarf hamster, re cage cleaning. All hamsters are territorial but when tame they usually accept your hand in the cage (although ours gets worried and follows the hand about to see what it is doing!) They are particularly concerned about their nest and their hoards, so it's best not to ever remove the nest, unless it is wee soaked, and even then, try and leave some of the old nest behind (there is usually some dry parts even if slightly whiffy) and put out new torn up strips of white toilet paper - a big mound somewhere in the cage - so they can pouch it and rebuild their nest. If I've had to do this (hasn't happened too often as ours uses his potty) I tend to leave him on his own for two or three days afterwards to settle down again. Also don't remove their dry hoards when cleaning, unless they are wee soaked and if you remove any hoard, always replace it with new food in the same place. If they think someone is coming in stealing their hoards they will either see you off, or possibly start weeing on them to scent mark them and that becomes a vicious circle! (Been there). Obviously you need to check to remove any fresh food that could go off, but ours tends to eat anything fresh straight away and only hoards the dry food. So any food you find in his nest or various bits of his cage, best to leave it or put new there if it is wet. There might be something in all that that could help both your hamsters, along with Souffle's taming ideas and not handling Munchkin directly. It sounds like basically you need to reduce their stress somehow, along with building their trust in you so they are a bit tamer. Unless Sassy already is tame. What cage is Munchkin in? Anyway this is Erin's cleaning tips video - definitely worth a watch (I should be getting commission the number of times I've linked it lol). Cut out the base of the shoe box, so the lid is the top shelf. Cut a door in the front, and put the shoe box house directly on the substrate (they usually like burying hoards under their nest). It should also mean less cleaning necessary. If it works out well you could think about getting a wood house, but a shoe box house can be made to look interesting too and easy chucked if it gets wet or damaged. 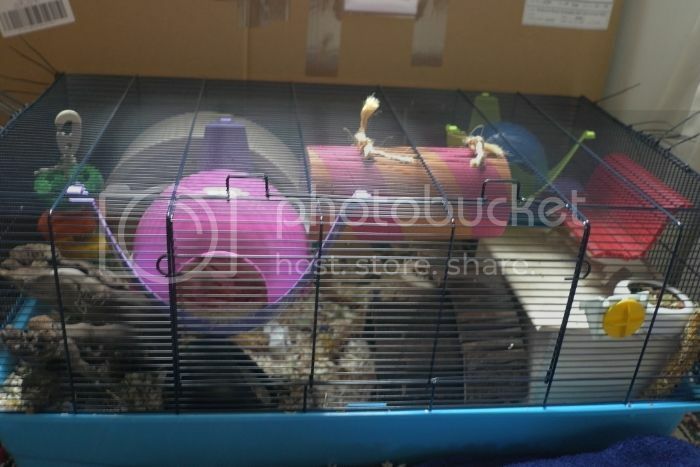 I've added a photo of Charlie's old Savic cage showing what I mean, and a photo of him in his nest in his current large house. Sorry this post is so long! But one last thing, make sure Sassy has plenty of chews (I'm sure you do) and cardboard to chew on - a kitchen roll tube or half an egg box in the cage eg. Chews they can't resist are the Antos mini toothbrushes and alligators (they're actually dog chews but fine for hamsters). I also get the Rosewood naturals dandelion stick chews - Charlie ignored it for a couple of days and then realised it was nice and demolished it. You could try scatter feeding as well. Put half her food in her bowl and scatter the other half in the cage so she can forage for it - it distracts them as well. This might help with Munchkin too if he is so territorial over his food bowl. Here's the before and after photos of the Savic Mickey 2XL 80 x 50 (same height as HH as well). The hanging ladder came out as it was a bit dangerous. Last edited by Serendipity7000; 03-01-2016 at 06:52 AM.